MANILA, Philippines - The Professional Regulation Commission (PRC) announced on Thursday, December 3 the deferment of September 2015 Licensure Examination for Teachers (LET) passers registration due to implementation of new system. 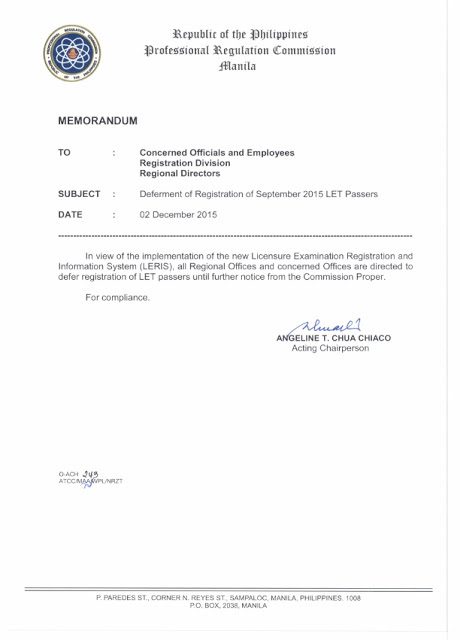 The commission postponed the registration which is supposed to start on Monday, December 7, 2015 in view of the implementation of the new Licensure examination registration and Information System (LERIS). PRC through a Memorandum signed by Angeline T. Chua Chiaco, Acting Chairperson advised that start of registration date in all offices (Manila and provincial branches) will be announced later. December 7, 2015 UPDATE: PRC announced schedule of registration for Manila passers of the September 2015 Licensure Exam for Professional Teachers. Venue is at the PRC Ground Floor, Main Building. Registrants are advised to proceed to the nearest PRC Office for the printing of your oath form. Registrants are also advised to strictly observe the schedule for initial registration to avoid any inconvenience. Observe the following steps here. December 15, 2015 Update: PRC Cebu announces schedule of initial registration. (Monday) ABBA, CRISTY V. - BACO, LIGAYA R.
(Tuesday) BACO, SALOME A. - CABCABAN, LLOYD Q. (Wednesday) CABEL, JUDY ANN T. - DACAY, JENELYN G.
(Thursday) DACILLO, CLAIRE DEL ROSARIO - FLORES, JONNA F.
(Friday) FLORES, KENNETH RUTH V. - KINILITAN, LOUGENE R.
(Tuesday) MASAS, CRESA HYACINTH R. - PANISAN , SARAH MAE R.
(Wednesday) PANOASI, CIRILA L. - ROSALES, NOVELY A. (Monday) ROSANI, JESSA MARIE T. - TAOJO, LEAH D.
(Tuesday) TAPALES, RHEA T. - ZUÑEGA, SHEIRLY C.
(Monday) ABADA, JAN ABNER O. - BACALSO, NIFALBEN T.
(Tuesday) BACARO, MARY JOY M. - CAHANAP, VANESSA CARAMEL B. (Wednesday) CAHULUGAN, ED VINCENT A. - DELA PEÑA, JOEMARY A. (Thursday) DELA TORRE, ANNEVIEVE G. - GENSON, VANESA B. (Monday) LERASAN, CINDY S. - NAHAMA, DAYANA L.
(Tuesday) NAHIAL, MA. LUZ A. - PUSOD, CARLITO M.
(Wednesday) PUTANES, JESSIEL T. - SON, MORINO JR. S.
(Monday) SORIANO, NATHALIE RHONA D. - ZULUETA, ANSILMA C.
The agency on Monday, November 30 released the results of professional teachers exam. A total of 21,461 elementary teachers out of 68,442 examinees (31.36%) and 34,010 secondary teachers out of 81,463 examinees (41.75%) successfully hurdled the exam. The results of examination with respect to seven (7) examinees were withheld pending final determination of their liabilities under the rules and regulations governing licensure examination. Meanwhile, PRC already activated the verification of results page for September 2015 LET. Details can be found here as well as the updates on oathtaking schedule and venue. TheSummitExpress will update this page once the new schedule has been announced online. Like Us on Facebook or Follow Us on Twitter to receive relevant information. You may also subscribe to our E-mail list.